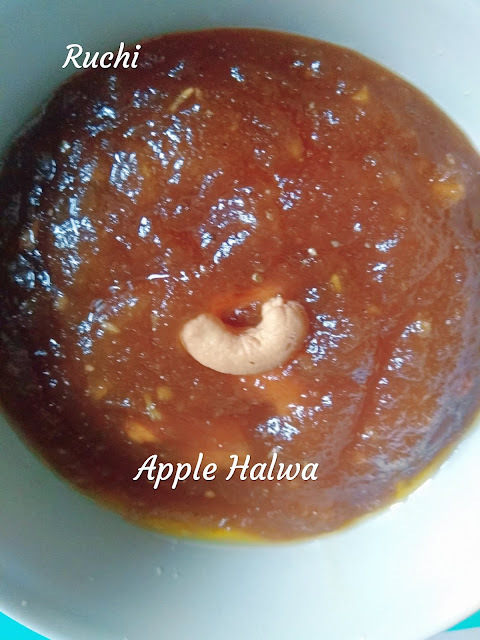 Apple Halwa is a flavourful sweet dish thatyou can make for festivals. popular dessert recipe is made of apple, ghee and sugarand dry fruits and is truly delicious and healthy. Kids would also love tthis lip-smacking sweet. 1.Wash the apples and peel them. processor till the apples are well grind. Ghee heated add grinded apples. 4.Cook the apples till all the water is evoperated. Then add sugar . 5.As the sugar melts, the halwa will again become liquidy. 6.Cook for 5 minutes by adding ghee in between and stirring continuously till all water evaporates. 7.Then add cardomon powder and mix well. 8.Garnish with dry fruits and serve hot.